Mayor Bill de Blasio presents the Fiscal Year 2020 Preliminary Budget. City Hall. Thursday, February 07, 2019. Credit: Ed Reed/Mayoral Photography Office. 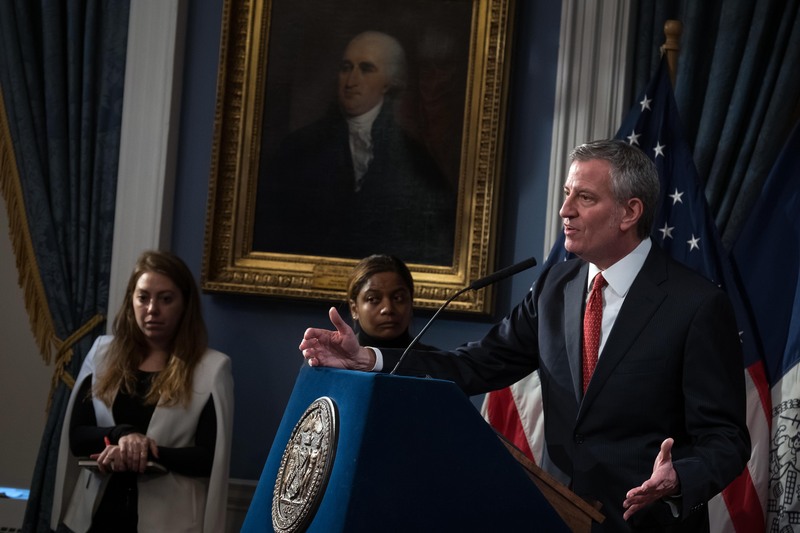 Painting a grim financial picture, Mayor Bill de Blasio pitched a preliminary $92.2 billion budget proposal Thursday with few education highlights beyond implementing a new union contract and continuing to expand preschool for 3-year-olds. While proposing a $3 billion boost to next fiscal year’s budget, De Blasio said this is the most “uncertain” plan he’s put forth as mayor, owing to financial uncertainty including forecasts of a $935 million dip in income tax revenue, an unfavorable budget proposal from Gov. Andrew Cuomo, and political turmoil in Washington D.C.
It’s not the first budget de Blasio has raised financial concerns about the adequacy of state and federal contributions to the city’s education needs. This time, de Blasio said Cuomo’s funding proposal lacks about $300 million New York City schools require next year. The city has had a partial hiring freeze in place, but now, each city agency — including the education department — will be required to find places to trim, though de Blasio said he didn’t anticipate layoffs just yet. It’s too early to tell where the education department will find the savings, but de Blasio immediately pointed to eliminating the reliance on outside consulting contracts, which the city is already proposing to slash by $23 million. The preliminary budget — which is the first step in a budget process that involves the City Council — does not devote major dollars to new education initiatives. However, de Blasio said more than $632 million of new funding would go toward existing education programs: special education services, funding 3-K programs, and paying for mandatory charter school expenses. De Blasio’s proposal would earmark another $25.2 million for new 3-K seats in the Bronx and Brooklyn, which he announced during his State of the City address last month. That money would help create 1,900 new pre-K seats in districts 8 and 32, according to his proposal. “3K to me is a mission-critical investment,” de Blasio said during the press conference. Under the mayor’s proposal, another $9.3 million would go toward a new science curriculum in “participating K-8 schools.” No further details were immediately available about what the new curriculum would entail or how many schools might be involved. Education officials have been taking a “system-wide” look at curriculum and what schools are using. The city is proposing $23 million worth of cuts for the central office, which city officials said were related to the end of outside consultant contracts. This reduction is separate from the additional cuts de Blasio indicated may be necessary in this area to balance the city’s books. “There’s been a longstanding question about whether [education officials] have become too dependent on consultant contracts and whether there are areas they can cut back without affecting direct services for kids,” the mayor said. The city expects to spend $8.6 million less on the mayor’s Renewal School program, which budget officials attributed to efficiencies and fewer schools needing to participate in the school turnaround program. It was already cut by about $3 million for this fiscal year but the additional reduction was not a signal of phasing out the program, city officials said. Once again, De Blasio’s preliminary budget doesn’t renew funding for 69 social workers who provide support services to homeless students living in shelters under the Bridging the Gap program. The funds for this program will expire by the end of this school year. In the past, de Blasio has excluded this pool of funding — about $14 million in the current budget — and later added the money back into the final budget proposal after backlash from advocates. On Thursday, de Blasio said it’s “an area we’re continuing to perfect,” and that the administration “intends” to stick it in the budget going forward. About 114,000 New York City students are homeless. $6000 or so a year is spent per every 6th grade and younger student who takes a bus to school, which includes yeshivas and other private schools. This is absurd, particularly as it costs me $2500 a year for a private bus to take my middle schooler 30 minutes away. Why is the city paying 2x as much? Why is the city providing this at all? Give everyone bus/subway passes. Putting de Blasio in charge of education is like putting Trump in charge of diversity and inclusion.